The Huawei MediaPad M5 Lite 8 is a middle-class tablet with a mostly metal body, decent hardware, and Android 9.0 Pie. It features an 8-inch full HD screen, a Kirin 710 octa-core processor, up to 4GB of RAM, and up to 64GB internal storage. Other specs include a 13-megapixel camera, Harman-Kardon speakers, and optional GPS and 4G LTE. Read on to find out everything you should know about the Huawei MediaPad M5 Lite 8. While the Huawei MediaPad M5 Lite 8 is relatively inexpensive, we still do get a mostly metal body. However, there are two plastic bars on the top and bottom. On the top and bottom, you can find one speaker each which is developed together with Harman-Kardon. Next to it, we get a standard headphone jack on the front. The cameras offer a resolution of 8 and 13 megapixels. With 8.2mm, the tablet is not thin at all. However, it is pretty light for an 8-inch device with 310g. You can get it in Dark Grey and Champagne Gold colors. The MediaPad M5 Lite 8 has an 8-inch screen with an aspect ratio of 16:10. It is a standard IPS screen with 2.5D curved glass and a full HD resolution of 1920 x 1200. Underneath, we get a HiSilicon Kirin 720 octa-core processor. That one is made of four 2.2Ghz Cortex-A73 and four 1.7GHz Cortex-A53 cores. It is supported by an ARM Mali-G51 MP4 GPU. Depending on the version, you can get it with 3GB or 4GB of RAM. You can also choose between 32GB and 64GB of internal storage. If you want, you can get it with 4G LTE built-in. By the way, unlike its bigger brother, there is no fingerprint scanner. 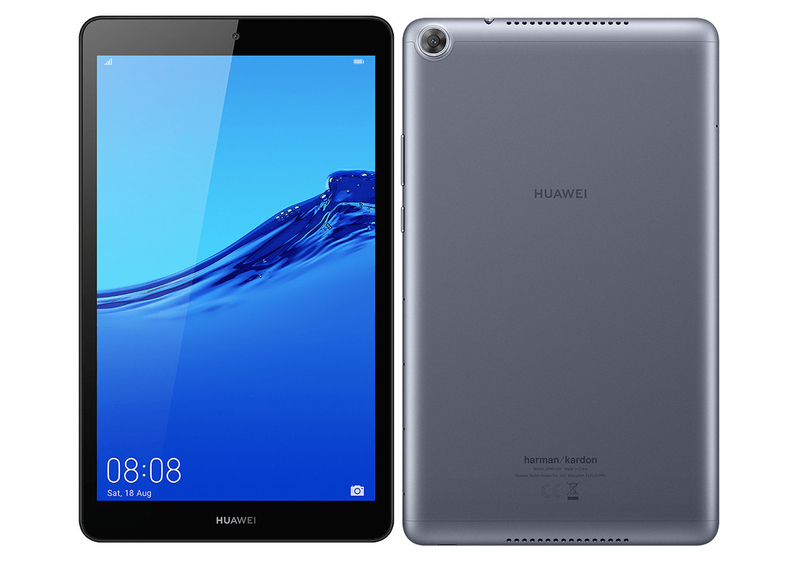 Huawei announced the MediaPad M5 Lite 8 on March 25th 2019 in China. Prices start at 1199 yuan and can go up to 1599 yuan including 4G, 4GB RAM, and 64GB storage. As of writing this, we don’t know if it will be available elsewhere in the world. Let’s check out some alternatives to the Huawei MediaPad M5 Lite 8. If you are looking for a more powerful tablet, you should check out the Huawei MediaPad M5 8. With that one, you get a higher-resolution screen, better gaming performance, and a fingerprint scanner. However, it costs more too. A cheaper alternative is the Chuwi Hi9 Pro. Its processor is not as powerful, but we do get a high-resolution screen and mostly metal body as well. The Huawei MediaPad M5 Lite 10 is the bigger brother of the Lite 8. As the name suggests, it is an interesting alternative if you need a bigger tablet. The Huawei MediaPad M5 Lite 8 is an 8-inch tablet featuring a full HD screen, a Kirin 710 octa-core processor, and Android 9.0 Pie. It also has two speakers, optional 4G LTE, and can be bought with up to 64GB of internal storage.